As someone who makes a habit of eating healthfully and exercising regularly, from time to time I find myself defending my lifestyle choices. I am sure many of you who are reading this have experienced this as well. People are often interested, and sometimes appalled, to hear that I would rather spend my Friday night in the gym than at happy hour, or that I would gladly choose some dark green leafy vegetables over a side of bacon. In effort to explain (and perhaps justify, depending on the audience) my lifestyle choices, I have tried out many different lines of reasoning. 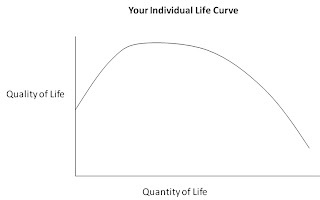 Nothing I have come across does a more effective job summarizing my overall reasoning than the concept of the life curve. I have noticed that generally we think of our lives as a string with a definite beginning and an end. Your life begins when you are born, and it ends when you die. When you think about your life this way, it leads you to consider health in a one-dimensional fashion. Most health-related matters eventually boil down to whether or not they will immediately sever your lifeline. I am sure you have often heard someone lament that a particular activity or food “is not going to kill you” implying that if death is not a likely outcome, then it is without consequence. This sort of thinking also makes healthful eating and regular exercise somewhat easy to dismiss because, let’s face it, your life could end abruptly at any moment. And it seems reasonable to conclude that since “life is short” you may as well have a good time while you can and not worry all the time about extending your lifeline, right? That all seems logical given the information that we have, but perhaps there is more to the story. In the above illustration, the x-axis represents how long we will live, just as it does in the one-dimensional representation of your life. The y-axis represents our quality of life. 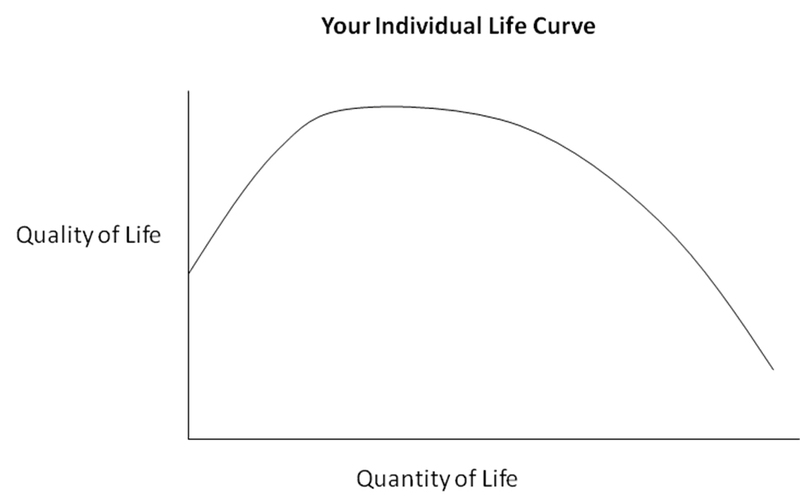 The higher up the life curve is on the y-axis, the better the quality of life. Here ‘quality of life’ represents many things. For example, immune system strength, bone density, body composition, energy levels, the ability to concentrate, and how long you can run are all examples of quality of life. The list is seemingly endless, and can best be prioritized by you. ‘Quality of life’ is a relatively abstract term, but this concept can significantly change our thinking. Length of life is no longer paramount, but secondary to how we will feel each and every day while we are alive. And believe me, all of our actions matter. Everything that we eat, all of the exercise that we do, how much sleep we get each night, and our overall level of stress, among many other things, all impact quality of life. Our behavior has real and tangible consequences that will be felt not only in the short-term, but in the long-term as well. Everyday decisions that we make have the potential to impact the rest of our lives. The next time that someone is giving you a hard time for choosing water instead of wine, spending an extra fifteen minutes on the treadmill, or forgoing the cheese on your sandwich, encourage them to add a second dimension to the way they consider their lifeline. You may just have an easier time justifying your position.